The versatile Jané Travel baby carrier will last you from birth, right through the toddler years, and is ideal for when you are out and about with your little one. Great for keeping your newborn close so you can offer them reassurance out in the big wide world and particularly handy if you are out when your child is older and you don't have your stroller and they want to rest their tired legs. The Travel baby carrier has been ergonomically designed to ensure maximum comfort for both you and your baby, and the adjustable design features generously padded shoulder straps (4 cm) and waist belt to relieve pressure on your lower back when carrying your child. This baby carrier has the advantage of being able to accommodate your baby in 1 or 3 positions; either to carry your child facing inwards, outwards or carried on your back, depending on baby’s age. Extra thick 4 cm luxuriously padded straps that relieve shoulder strain and give optimal comfort and support. Sturdy waist belt for improved carrying ergonomics. Lower back support. Softer satin fabric. 3 position carrier - child facing inwards, outwards or carried on your back. 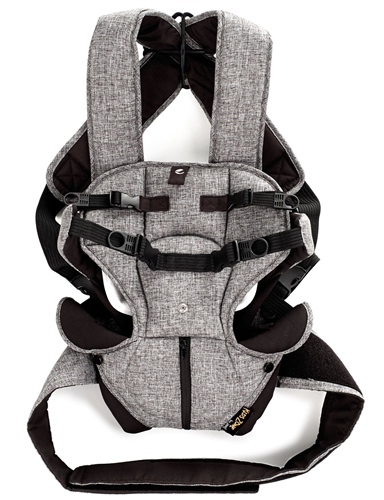 New padding to hold and support your baby’s back in place.